Access to cheap labour, materials and ready-made factories ensures India is one of the world’s mass-produced, ready-to-wear powerhouses, producing millions of pieces per day. However, it also boasts a rich crafts and textiles heritage. Artisanal fabric traditions can be traced back centuries and each region has its own unique style. The slow fashion hand made by the skilled craftsmen and ladies still thrives – you just need time to discover it. Small-scale independent craftspeople promote the traditional way of creating beautiful pieces using specialised skills passed down from generations. The Banjara community (meaning “the wanderers of the jungle” in Sanskrit) lived originally between Afghanistan and the Indian state of Rajasthan. Nowadays they have spread all across India. The women specialise in Lepo embroidery, which involves stitching little pieces of mirror and decorative beads onto clothes. As the result the fabrics turn into the “sea of tiny mirrors” which are very responsive to bright sunlight. Use Banjara fabric in your interiors for cushions. These pillows would be especially suitable on the veranda, where direct sunlight plays with the tiny embroidered mirrors of the fabric. The best place to purchase these is in a busy market in Rajasthan. Where have you discovered your favourite textile finds? Please share your experiences, ideas and suggestions in the comments box below. The world is full of beautiful colours, textures and patterns; each hemisphere, continent, archipelago and country boasts an array of cultural riches which are just waiting to be discovered. Hunting for exotic textiles in far-flung, hidden corners of the world is one of my favourite – and most rewarding – experiences; so many of my discoveries have incredible histories just waiting to be told. I feel it’s Design Junkie’s duty to amplify these stories to eager audiences. But before I tell you a little more about how and where to find some of these treasures, let me tell you a little more about my philosophy. Design Junkie embraces unique cultures, preserving traditional methods passed on from generation to generation and creating a sustainable production environment to ensure time-honoured rituals continue to thrive in modern times. This is central to everything we do; without local support, these amazing textiles which enliven our homes would become a relic of a previous era. The ornamental Molas designs originate from body paintings of Kuna women, indigenous people who live on small coral islands in the San Blas Archipelago along the Atlantic coast of Panama. After the Spanish colonisation, the Kuna women began to transfer their traditional geometric designs on fabric, first by painting and later by using the technique of reverse appliqué. Originally, only the geometrical designs were used but realistic and abstract images of flowers, birds and animals were also added to the selection of images. The fabric (Mola originally meant bird plummage) can work as an eye-catching cushion cover, offering something different to nursery interiors. Best place to buy a Mola? If you are visiting Panama City there are two very good places in Balboa. One is the old YMCA building on Calle Balboa. It looks more like a warehouse, and inside you’ll find lots of booths selling molas, taguas, cocobola carvings. The other place is also on Calle Balboa, but it’s a little closer toward Panama. It’s a barn-like structure called Centro Nacional de Artesanías. Inside are a number of stalls where a number of Kuna Indians have good molas. If you are heading to Peru, look out for their unique blankets. “Frazada” means blanket in Spanish, originally made for the freezing weather in the snow-capped Andes mountains. Every blanket is woven from hand-spun alpaca and sheep wool using a traditional back-strap loom in isolated rural communities. Two pieces of cloth are made to the width of the loom and then sewn together. It takes around six weeks to finish one. They are thick and each is one-of-a-kind in colour and design. Normally the wool is dyed using natural colours such as plants, fruits, roots and insects. It’s a great way to add bright colours to your interiors! They can be used as rugs, throws, table cloth, bed coverings or wall hangings. The possibilities are endless! If you are going to Cusco please visit the following markets: Pisac, Chinchero and Baratillo … the last one only if you really want to make the effort and get up at 5am. Bolivia is famous for its Aguayo – a traditional woven blanket used to carry babies and small children, as well as all kinds of items, wrapped on their backs. The native aguayo is a big square, handmade from wool of llama, alpaca or sheep and would be knotted at the front. These blankets typically feature colourful stripes intercalated with rhombuses and other figures with symbolic values. The aguayo is mostly associated with Aymara and Quechua culture. Today you can find multi-coloured aguayos made with synthetic materials and their production is semi-industrial, making them amazingly affordable. Arrange your Aguayo on the table, as a picnic blanket or use it as a throw on the sofa. La Paz, Bolivia’s capital, is a beautiful destination and home to markets which are great for picking up bargains: Witches’ Market, Mercado 16 de Julio, Ayni and Comart Tukuypaj. 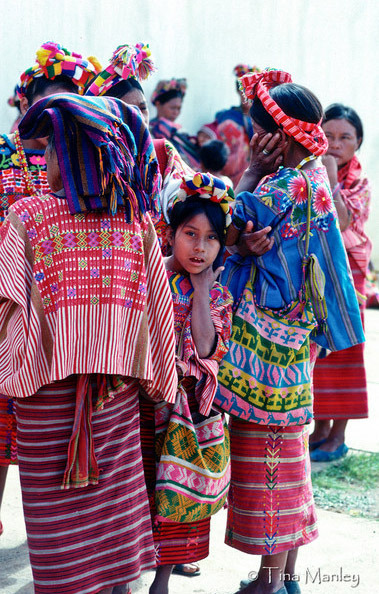 Huipil is the most common traditional garment worn by indigenous women from Central America. It is a hand-embroidered fabric originally used for making blouses (a loose-fitting tunic) made from two or three rectangular pieces of fabric which are then joined together with stitching, ribbons or fabric strips, with an opening for the head and, if the sides are sewn, openings for the arms. Originally, the huipil fabric was woven on a back-strap loom, using a hand-picked brocade technique, and could take up to a couple of months to weave. Embrace the spirit of Guatemala by upcycling vintage textiles for amazing projects like bags, folk wallet, bohemian table runner, cushions, or reupholstering an old chair. Chichicastenango’s markets are reputed to be the largest in Central America. They isn’t far from Antigua or Guatemala City, but it still takes a couple of hours to get there along windy and patchy mountain roads. Markets in Antigua: Eplore the maze like stalls of El Mercado and don’t miss Nim P’ot. Otomi embroidery depicts colourful scenes from everyday life. Arranged in symmetrical form, every cloth tells its own story. This particular embroidery design came about after a drought in the 1960s devastated the agricultural economy of the Otomi communities in central Mexico. The women needed to find an additional source of income with a design that used threads resourcefully. A bold and distinctive embroidery style arose out of economic necessity due to the women’s innate sense of design and understanding of cloth and skills practised by Mexican women for centuries. The most common elements include flora and fauna in vibrant colours including birds, chickens, dogs, deers, flowers and trees. Pieces are also often called Tenangos and they use 100% natural cotton as a base. These unique pieces celebrate ancestral techniques. This time-honoured textiles require a long process. A piece of 2 x 2 meter will take 6-9 months to finish. Otomi textiles are generally used as a bed covers, table runners, placemats, poufs and cushions. Insurgentes Market: This upscale market, based in Ciudad de México, on the Reforma side of the Zona Rosa is the best place for jewellery and the beautiful embroidered cloth by the Otomi Indians. If you prefer to keep the decor minimal and monochrome, as opposed to he colourful, have a look at Ponchos from Argentina. Long before the Spanish conquest, the indigenous people of Argentina made refined textiles to dress. Made of wool from domesticated llamas, they used them to protect themselves from the cold and require months of work to finish. The colours come from the vegetal or mineral tinctures of the region. The main colours range from a dark red with black stripes to brown, ochre and beige. They are part of a rich Argentinian tradition of ancient skills. Every poncho is handmade using wool cradled and spun by hand. Hopefully these traditional textiles have inspired you to travel and explore further and support the local craftsmen and artisans while filling your nomadic treasure chest. Have you visited any of these countries?